One Belt, One Road! China's bid to world economic dominance! One Belt, One Road! China's bid to world economic dominance! One Belt, One Road! China's bid to world economic dominance! One Belt One Road or 一带一路 or OBOR or Silk Route 2.0 – Many of you have probably heard one of these terms in recent days. The project started by China’s President Xi Jinping in 2013 is now worth almost US$1 trillion. Xi looks back to the golden era of China’s economy, a time when luxury goods such as silk, gold and gems were transported from China through Central Asia, the Middle East, Africa, Europe and the Mediterranean. Only this time, the new route will be built with monster cranes and modern technology, trains and ships to replace horses, camels and elephants. The impact, MASSIVE! Imagine the opportunities that will be created from this – more businesses leading to more jobs to more trades between east and west, exchange of cultures, languages, customs and religions. In short, a much better economy for Asia as a whole. How now could you as an individual benefit from all this? “While it’s hard to quantify the total number of projects and amount of financing, the China Development Bank alone has reserved US$890 billion (S$1.24 trillion) for over 900 projects, highlighting the magnitude of this undertaking,” says Oxford Economics’ He Tianjie and Louis Kuijs in a research briefing on April 27. But before we delve into the new silk route, I believe it is of utmost importance to understand what happened in the past, the vast beauty of the old silk route that was started by little worms producing silk on a tree in Chang’an (now called Xi’an). This will give us a perspective of what to expect in the future. 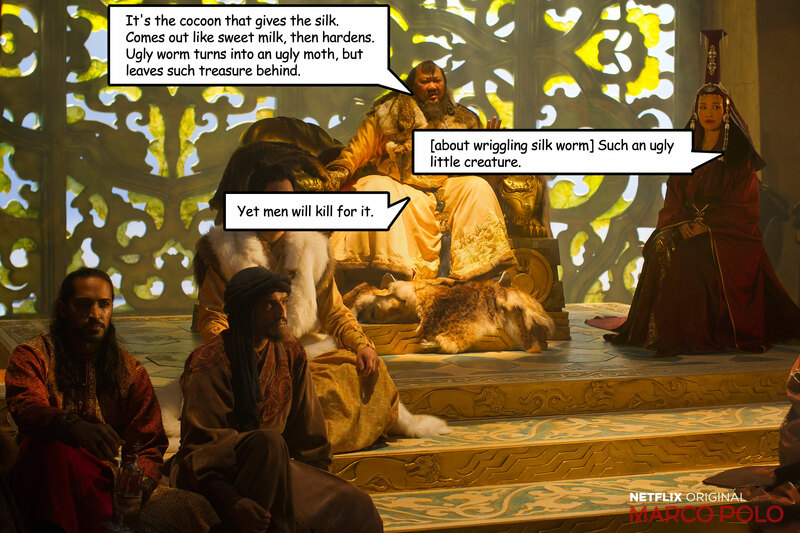 A conversation between Kublai Khan and Princess Chabi in Netflix Originals, Marco Polo. The Silk Route got its name in 1877 by a German geographer. The route did not only circulate silk between the east and west but since silk, mainly purchased by aristocrats and billionaires, was the most profitable trade on the route, it was named The Silk Route. I was going to write a detailed history here about The Silk Route, how it started, the evolution of it but I chanced upon this awesome video by CrashCourse, so I’ll leave you to watch it to get a quick understanding of the old silk route. Undoubtedly, The Silk Route has been responsible for almost every aspect of civilization – religion, philosophy, trade, language and technology. While every good thing has a bad side, so did the silk route. The transmission of diseases along the route was cited as one of the main reasons besides war for the closure of the route. Companies and merchants then used the sea to transport goods. The reason why the name One Belt, One Road was used is to describe the nature of the how the business will take place. “One Belt” refers to land transport, mainly railway that will be used to transport goods from China to the Middle East and Europe. Studying the proposed route in Mr. Xi’s plan, I realized there were vast similarities with the Silk Route used back in the old days. The “One Road” on the other hand refers to the sea route that will be used to connect the major ports between China to the rest of Asia and finally to Europe. The number of countries that will benefit from this policy is still unknown as there are no official members to the project. However, it is expected that roughly 68 countries spanning from China, South East Asia, the Middle East and Europe will benefit from this plan. One thing you must know is that Mr Xi is playing his cards differently from how the US is playing it. First, there was the Marshall Plan back in 1948 where the US gave over US$13 billion to help Europe rebuild itself after the war. We will not talk too much about this today. Then, came the Transatlantic Trade and Investment Partnership (TTIP) and the Trans-Pacific Partnership (TPP). Although Mr Trump abandoned the TPP earlier this year, it still plays an important role in our understanding of the world economy. The TTIP was signed to promote trade between the US and Europe. The TPP, on the other hand, was signed to promote trade between the US and Asia. In both cases, the US is the main focal point and would reap the most benefits. 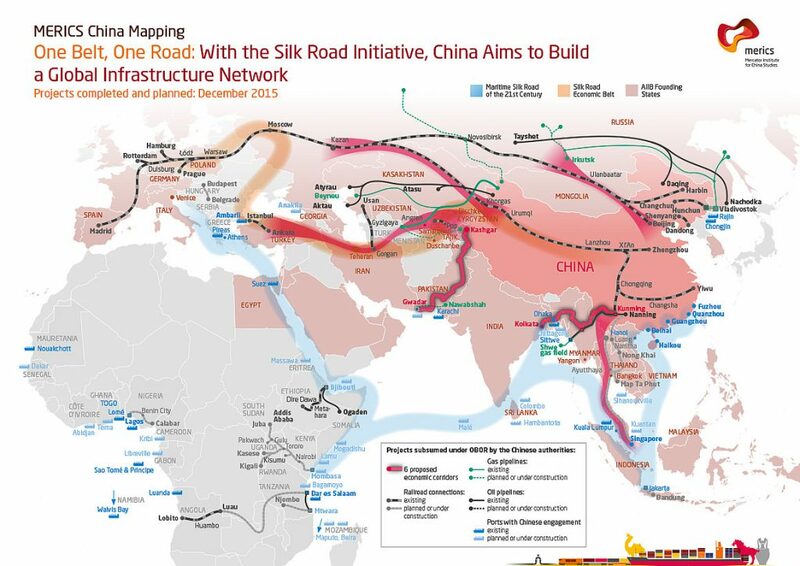 However, Mr Xi’s planned One Belt One Road project is treating Europe and Asia as one space with China as the focal point and quite rightly so as the entire continent is connected via land. With this plan, Mr Xi has 2 major objectives to achieve; economic diversification and the development of China’s economy into a global superpower. What is in it for us as investors? Projects under the One Belt One Road are huge. There are multi-billion dollar projects being signed between the Chinese and the 68 countries involved. It is said that US$900 billion worth of projects is reported being signed and agreed upon. Pakistan’s Gwadar port is currently being developed by China. Cost: approximately US$50 billion. The project includes the building of new roads, 1,800km of railway lines and oil pipelines. It is estimated that upon completion, a million barrels of oil will be transported within a day on these lines. 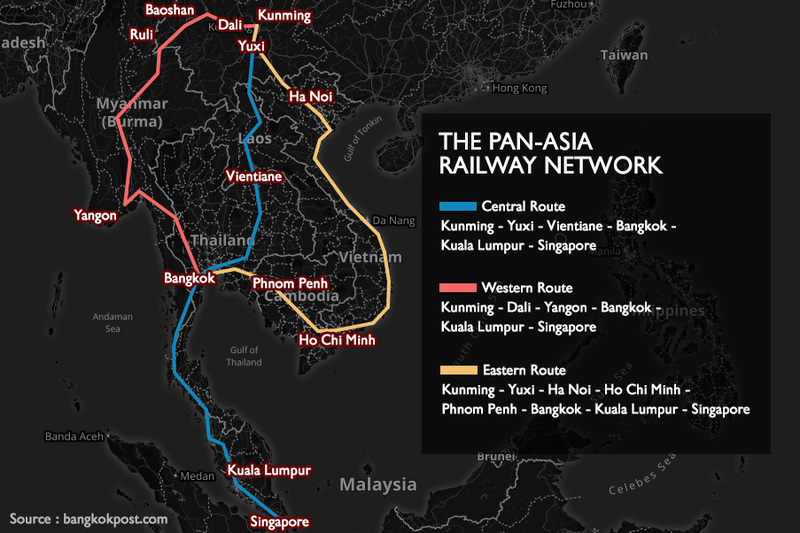 In South East Asia, China plans to connect 10 major cities, with 3 major railway lines, the central route connecting Kunming in South China to Bangkok and down to Singapore, the western route from Kunming to Bangkok via Myanmar and the eastern route from Kunming to Bangkok via Vietnam and Cambodia. On November 19, 2013, the Thai Senate approved a bill that allows the government to borrow US$69.5 billion to build the high-speed rail lines. We also saw the agreement between Malaysia and Singapore to build a similar line which cost in the region of US$15 billion. One can only imagine what the entire project would cost. US$500 billion maybe? On December 29th, 2014, the Chinese Government pledged US$40 billion for the creation of a Silk Road Fund to foster increased investments in countries along the One Belt One Road project. Some US$1.65 billion were invested in the Karot hydropower project in Pakistan. A rail link was also built between Nairobi and Mombasa in the African region. Next, comes the Asian Infrastructure Investment Bank (AIIB) which was first proposed by China in October 2013. The bank backs projects in the region related to the One Belt One Road initiative. In 2015, a total of US$160 billion had been lent out for projects that are now in the planning and construction phase. I could go on and on telling you about the projects and money being poured into this initiative but I’m guessing you already get the gist of it by now. And probably one question lingering in your mind is “how can I participate in all of this?” Well, I’ve taken the initiative to do a list of 26 counters that you can invest or trade in to be part of One Belt, One Road. You can download the list below. YES, I WANT TO START INVESTING IN CHINA! We are part of the PhillipCapital Group of companies that was founded 42 years ago & with offices in 16 countries and regions. The group has over $1bn in shareholder funds and $30bn in client assets under custody and management globally. PhillipCapital is a name you can trust.